The Conference of American Armies (CAA) is a Military Organization of an international nature made up and led by Armies from the American Continents, with the authorization of their respective countries, whose aims, structure and functions are found in the "REGULATIONS OF THE CONFERENCE OF AMERICAN ARMIES"
Founded in 1960 as an Army Commanders International Organization in the Western Hemisphere. Today it operates independently under its own CAA by-laws approved by the all CAA member army commanders. Antigua & Barbuda, Argentina, Bolivia, Brazil, Canada, Chile, Colombia, Dominican Republic, Ecuador, El Salvador, Guatemala, Honduras, Mexico, Nicaragua, Paraguay, Peru, Trinidad & Tobago, United States, Uruguay, and Venezuela. 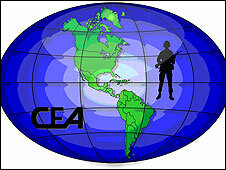 The five observer armies of the CAA are: Barbados, Belize, Guyana, Jamaica and Suriname. 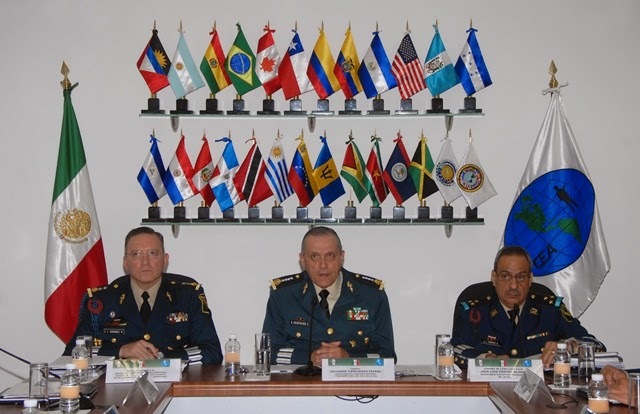 Two international military organizations also enjoy observer status: the Conference of Central American Armed Forces and the Inter-American Defense Board. The flag is the logo on a white horizontal flag, as seen here. Image taken from this link, which in turn, belongs to this group. Here's another picture where one can see the following: on the bottom shelf, starting from left to right starting with the flag of Nicaragua and ending with the flag of Jamaica, one can observe that the last three flags are of international organizations. The first one is the flag of the Conference of Central American Armed Forces, the next one is the the flag of the Inter-American Defense Board and the last one is the CEA-CAA flag.